"I have stage-four metastatic ovarian cancer. There is no stage five." Vivian Bearing (Emma Thompson) rests on her hospital bed in almost-complete silence and simply stares ahead into the open space of her room. A victim of terminal ovarian cancer, this renowned university professor now must face unbearable pain from full doses of chemotherapy. Instead of watching television or conversing with visiting friends, Vivian ruminates on her life and thinks about the words of the poet John Donne and others. She's isolated from the world, yet retains her sanity through her witty and astute nature. Based on the 1999 Pulitzer Prize-winning play by Margaret Edson, Wit takes an original approach to the terminal illness genre. Instead of having the usual overplayed drama of sadness and grief, director and co-writer Mike Nichols (The Graduate, Primary Colors) takes a more realistic approach. Vivian's adult life has revolved around the study of 17th-century metaphysical poetry, so her response would incorporate these texts. The events are addressed directly by Vivian to the camera in intriguing fashion; in fact, her character serves as the pseudo director of the film. When things start to move too slowly, she notices this fact and jumps the story forward. This nice variation keeps the straightforward and easily followed narrative from becoming dull or uninteresting. During each subsequent degrading episode, the audience is right there with Vivian and feels her intense suffering. This story does an excellent job in pinpointing the abrupt separation that Vivian undergoes with the rest of society. Her few human relationships occur with the nurses who take care of her and the doctors who study her reactions. Dr. Jason Parker (Jonathan M. Woodward) oversees her daily medication and progress, but his true interest is the research aspect of the disease. In one telling moment, his eyes light up while he discusses the amazing nature of the cancer that's killing her. His obsession lies within the scientific aspects, so he never really connects on a human level with his patients; his routine "How are you feeling?" conversation follows a typical structure and avoids focusing on Vivian's actual thoughts. What's compelling about this relationship is Vivian's realization that her own manner in the instruction of poetry followed a similar pattern. She never focused on caring for the students, and instead covered an intellectual path. Emma Thompson delivers a wonderfully complex performance that stands among the best in her accomplished career. While reciting the words of John Donne from her bed, there is no question about her scholastic aptitude and profession. Vivian lives and breathes these lines, and Thompson perfectly conveys her passion for the poetry. Her believability and stature makes it even more difficult to watch this character denigrate into a shell of her former self: her bald, sickly countenance reveals the depressing destruction of her once-healthy body. With each successive chemotherapy session, Vivian continues to lose her vigor, and the result is extremely troubling. The key with Thompson's performance is her ability to make the character both intelligent and compassionate. The effect is torturous because we've grown to care for her life. 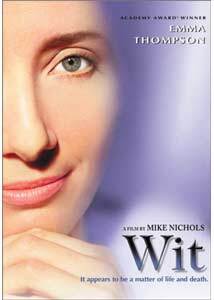 For a movie focusing on a terminal illness, Wit remains surprisingly engaging. While the final destination is apparent from the early going, it's the intimate scenes that keep the events fresh and worth watching. One of my favorites is a charming moment between Susie (Audra McDonald)—an especially caring nurse—and Vivian while enjoying popsicles. Susie relates a throwaway piece from her childhood, yet it creates a human bond that's lacking in this sad place. Although it drags at a few points, this film is full of the little touches that create effective cinema. Co-writers Nichols and Thompson deserve a tremendous amount of credit for transforming this acclaimed play into an impressive story. It takes a legion of wit to make this subject matter energetic, and it abounds here in Vivian's mind. Image Transfer Review: This disc contains an impressive 1.66:1 anamorphic widescreen transfer that corresponds with HBO's usual solid presentations. A few defects that spring up here and there, but they're rare and fail to distract from the movie. The colors work especially well and include a considerable amount of clarity and sharpness. This is evident specifically in the cloudier flashback scenes from Dr. Beary's younger days. The entire story essentially takes place in the hospital, which limits the visual creativity in the film. However, there's still plenty to appreciate from this well-done transfer. Audio Transfer Review: Wit utilizes an English stereo audio transfer that presents all of the dialogue in a clear and understandable manner. The simple and emotional piano score chimes in at just the right moments, and this track presents the music in elegant fashion. There are obvious limitations to this type of transfer, which lacks the depth and power of the Dolby versions. Still, it works nicely because the talk-heavy script requires little more to present the story. Extras Review: Wit features impressive, in-depth biographies for all the major actors in this production and director Mike Nichols. The font is easily legible, and each person's career is well-documented and thorough. Unfortunately, this is the only extra on this disc. However, this is fairly understandable since it is an HBO production originally aired on the network. This makes the lack of features less frustrating, although it would have nice to find out Emma Thompson's feelings for and preparation about the role. During my time in college, I took a class that studied the works of metaphysical poets like John Donne. It was one of the most challenging and difficult courses during my entire educational career. Wit incorporates this complex poetry into the saddening tale of cancer patient Vivian Bearing. Spurred by a superb starring performance from Emma Thompson, this story closely reveals the pain and emotions of a fascinating woman.